Agilent Technologies Inc. (NYSE: A) and Monash University Sunway campus announced a collaboration to promote talent and skills development for genomics research in Malaysia. This partnership, the first of its kind for Agilent with a university in Malaysia, will help Malaysia assert itself as a leading centre for life sciences research and development in Southeast Asia. Under the agreement, a centre of excellence known as the Monash-Agilent Authorized Microarray Service Centre will be established at Monash University Sunway campus. This centre will be equipped with the latest microarray instruments and will provide competency training for the centre’s lab professionals undertaking molecular-genetic studies of human disease. “The establishment of the AMSC will be a timely boost in the collaboration between Agilent and Monash University Sunway campus through the Jeffrey Cheah School of Medicine and Health Sciences, providing the opportunity to access advanced technologies to strengthen our current genomics research in diabetes, cancer, neurobiology and infectious diseases,” said Professor Dato’ Dr Anuar Zaini Md Zain, head of the school. He added that the school has forged strong collaborations with local and international academic institutions, as well as leading industry players in expanding its expertise in research. 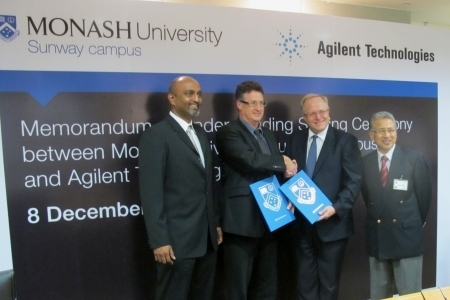 The collaboration between Agilent and Monash University Sunway campus will see knowledge-sharing between both organisations, including real-time communication of new developments in the field of microarray applications as well as networking with Agilent’s global customers who are shaping the future of genomics. Genomics is the study of all genes of an organism, and DNA microarrays enable the measurement of multiple molecular changes to genes. These changes can reveal the molecular basis of diseases, enabling scientists to discover and develop new methods of treatment for these diseases. “The Monash-Agilent Authorised Microarray Service Center, together with existing platform technologies at the school, such as liquid chromatography/mass spectrometry and proteomics, will encourage integrative and multidisciplinary research. The center will become the platform to train next-generation scientists in genomics research and potentially spearhead new niche areas in biomedical research through support and networking with Agilent’s global customers/collaborators,” said Prof Anuar. At the heart of this collaboration are highly sensitive and flexible DNA microarrays and the instruments and software to interpret them. DNA microarrays are manufactured by Agilent using the same cutting-edge technology used in ink-jet printer nozzles to literally synthesise new DNA strands directly on a glass surface. Then these strands (or probes) are used in experiments to detect changes in the DNA such as gene copy number variations, or to monitor gene expression levels under various conditions. Agilent’s SureScan microarray scanner provides the means to read information from these microarrays, enabling scientists and laboratory professionals in the new centre to leverage the latest tools for understanding the molecular-genetic basis of disease.